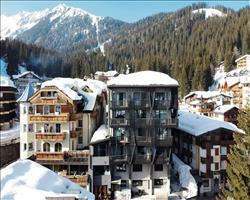 The ultimate guide to Madonna Di Campiglio ski holidays. 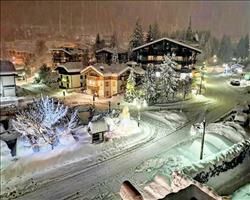 Among the classic destinations for Italian ski holidays, Madonna di Campiglio’s charming mountain village is one of the greats. Connections to Folgarida and Marilleva mean you can explore other areas without having to remove your skis (but with the standard of food on offer, you might want to give your legs a break in a mountain restaurant or two...). You’ll find Madonna di Campiglio surrounded by a wooded valley, between the cliffs of the Brenta Dolomites (now a UNESCO World Heritage Site) and the Adamello - Presanella glaciers. This drop-dead gorgeous scenery’s just one reason to ski here; it’s a classic in the skiing world, with traditional buildings and a lively atmosphere... And while others enjoy the buzz of the town, the joint ski area of Folgarida, Marilleve and Madonna di Campiglio is out there to explore. Launched as a tourist centre towards the end of the 19th century, the first ski lift was built here in 1948 and the place has been a magnet for snow lovers ever since. Still a small and cosy village with only about a thousand permanent residents, the streets are virtually traffic free and lined with elegant buildings and alpine huts and the main square is complete with an ancient church. Madonna is known as a place for the fashionable and famous which is reflected in its sophisticated bars, restaurants, hotels and shops. Despite its popularity with the social elite (with a bit of luck you might bump into George Clooney at one of the nightclubs…), it’s still managed to remain relatively unknown outside Italy. The lifts are fast, comfortable and modern but the best thing is that they’re in the heart of the village, unusual for such an old ski town. Most lifts are directly connected to the neighbouring resorts of Folgarida and Marilleve, which gives you the opportunity to branch out and experience new places without ever having to take off your skis. 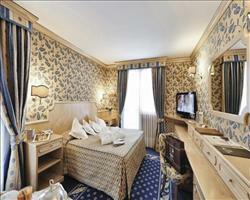 The nearest airport is Bolzano but most international flights come into Verona (2 hours away). If you're travelling by rail, the nearest train station is Trento (73km away). From here you can take the Dolomiti Express to Val di Sole where you can then get a cable car to the heart of the Folgarida -Marilleve –Madonna di Campiglio skiing area. In 2011 the lift was extended and the area was connected to Pinzolo by the Pinzolo–Campiglio Express – we reckon this gondola has one of the best views of the Dolomites. View our detailed Madonna Di Campiglio snow forecast or snow report and see all live webcams, piste maps, road and travel maps and lift pass prices. For a picture of historic snow conditions see the snow depths month by month with our Madonna Di Campiglio snow history. 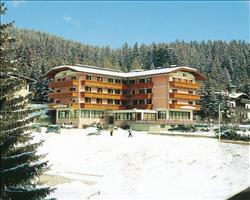 Nearby resorts: Passo Tonale, Marilleva, Folgarida. 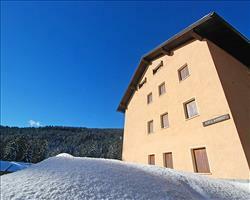 Beginners in ski school are usually taken by bus to the nursery slopes in nearby Campo Carlo Magna. Once ready to progress, there are two areas for relatively easy skiing at the top of the Pradalago and Groste sectors (served by the gondola from the village) where you'll find plenty of wide cruising trails - we like the 3 mile Graffer run in the Groste area which ends up in the village. Intermediates can enjoy some lovely long cruisey trails through forests. The new red piste Nambino (in the 5 Laghi area) is a must ski if you've had a couple of weeks on skis. 1800m long with a 453m of height difference, it’s accessible via the new Pancugolo chairlift. The local ski area is linked to Folgarida and Marilleva by ski lift which gives experienced Sno lovers a chance to try the challenging black runs amongst stunning scenery (you’ll need to upgrade to the Superskirama lift pass which covers the linked area). The DoloMitica piste is said to be one of the most difficult in the Alps - it starts at Punto del Doss di Sabion (2100 meters) and ends in Tulot (800 meters) near Pinzolo. Our resident adrenaline junkies also like The Star, which has a maximum gradient of 70% at one point… that’s pretty steep! There isn’t heaps of off piste and what little there is seems to be widely separated around a big area (this is largely because much of the surrounding land is National Park where off-piste skiing is restricted). There are several cross country trails with another available in Carisolo, a few kilometres away. Famous for its fur-clad clientele, this stylish resort doesn’t scream ‘boarder’s paradise’, but is surprisingly popular with snowboarders and regularly plays host to events like the FIS World Championship. The massive Ursus Snowpark is one of the top parks in the Alps and has 8 acres of terrain and 40 obstacles split into 3 areas. Night skiing is usually available at the legendary Canalone Miramonti slope if you fancy extending your ski time after hours. There’s a lot more going on in the evenings here than in other Italian resorts Italy; with a mixed following of young boarders and the Italian elite, the après includes everything from big nightclubs and lively bars to posh wine bars and cocktail lounges. Zangola is the biggest night club, famous for its dancing and late night partying. It's situated just outside the town but in past seasons there's been a bus which runs all night. Des Alps is the second (slightly pricier) nightclub in the village centre. Two cool watering holes are Bar Suisse and Cliffhanger - both known for their good beer and live music and Café Pasquini does an amazing cocktail if you fancy something a little more sophisticated. For a nice glass of Italian vino, we love Il Rustico Ballardini, where you can try a spot of wine tasting and learn the secrets of wine making. Everyone who’s skied in Italy raves about the food and this place is no exception when it comes to fabulous restaurants. If you’re looking for top notch cuisine then the Il Gallo Cedrone and Chalet Fogajard are great for special occasions. For cheaper options, the Ristorante Pappagallo and Le Roi are family friendly venues dishing up tasty Italian favourites. Those who want to take a break from skiing have the opportunity to try dog sledding, hiking and snowshoeing. If challenging black runs don’t quite get the adrenaline pumping anymore, you can always try paragliding - there are two flying sites (one here and another in Pinzolo). Ice climbing is available on Vallesinella, Nambrone and Nardis falls and the natural open air ice rink is great fun for all (skates can usually be hired from the bar nearby). When is the best time to ski Madonna Di Campiglio? The lifts usually open in early December and close near the end of April, subject to snow conditions. As the village is situated at an altitude of 1550 meters, with skiing possible up to an altitude of 2600 meters, there’s normally plenty of snow – and all pistes have snow making facilities if the conditions need a little topping up. For the best conditions of the season, our favourite times to visit are February and the beginning of March. Things do tend to get a little busier on peak dates like Christmas (see below) but in recent years the slopes have been hardly crowded at all. Madonna’s the perfect resort to visit with the family; bambini are welcomed with open arms by the locals and there’s plenty to keep children occupied on and off the slopes. Older children will love the varied skiing, awesome Snowpark and friendly burger bars like Jumper and there’s plenty for Mum and Dad too. Best of all, the resort is relatively unknown outside Italy and rarely gets over crowded - even in the school holidays - so you can enjoy the slopes, food and activities in your own space and time. We have a great range of family friendly accommodation, whether you’re looking to all muck in and book a self–catering apartment or opting for rooms in a hotel where you won’t have to lift a finger. If you’re travelling with children who are too young to ski, have a look at our hotels with childcare facilities so you can go out and explore the area. 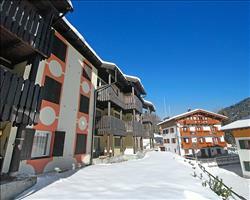 If your children will be having lessons, pick a hotel near the ski school or with a bus that stops outside. Many hotels have swimming pools, kids clubs and games rooms to help keep little ones entertained at the end of the day, making for a fun and unforgettable holiday all round. This is the perfect place for children to learn to ski. Children as young as 3 are taken care of by highly skilled instructors from the local ski schools and the children’s area is located directly in the village, next to the Belvedere practise run. If your kids have conquered skiing and want to try something new, this is one of the best places to learn to snowboard, with Zebra and Minoia being 2 specialist snowboard schools. 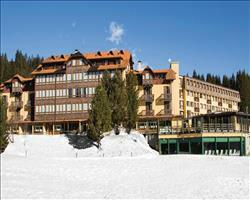 Teens will also love the huge Ursus Snow Park which has 3 different areas and around 40 structures. If the family want to ski together, there are plenty of easy runs in the Pradalago and Groste sectors that end back at the village. For clans who’ve been skiing for years, the black Spinale Direttissima starts in Monte Spinale and goes right back down to village level. From Pradalago, the long Amazzonia is a lovely run through beautiful scenery. The food is famously good here and a good dish of pizza or pasta is usually enough to satisfy any fussy eater. Two of our favourite restaurants for a family meal are Ristorante Pappagallo and Le Roi, which both have a lively, friendly feel and serve amazing Italian dishes. If the children want a break from skiing, there’s plenty around to keep them busy. The open air ice rink is great fun (skates can be hired from the bar nearby). Husky sledding with the Athabaska school at Piana di Nambino is something that’s great for adults and children alike if you want to treat everyone to something different. There is a cinema in the resort but in previous years it’s only shown films in Italian, so it might be worth packing a portable DVD player if you want a couple of hours of peace and quiet! We know what it’s like trying to book a holiday that keeps the whole brood happy, so call our ski specialists for helpful advice and assistance in booking a week to remember. There’s nothing better than gathering a group of friends and family together for an action packed week in Madonna. A variety of pistes means that there’s something for all abilities, especially thanks to linked access to Folgarida, Marilleva and Pinzolo by ski lift. Sci 5 Laghi and Sci Rainalter do private lessons if you want to fast-track learning to ski or learn together with friends. Once beginners are ready to move away from the nursery slopes, they can get the gondola from the centre of town to the top of the Pradalago and Groste sectors where there are plenty of wide cruising trails that end back at the village. More confident Sno lovers can enjoy some wonderful terrain including long, cruising forest trails. Nambino is a new red piste in the 5 Laghi area - perfect if you’ve got a few weeks skiing behind you (at 1800m long with 453m of height difference, it’s a nice, thigh-testing challenge). 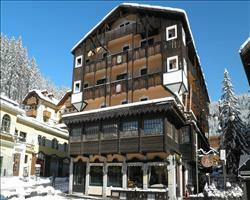 Experts can try the black runs in Folgarida and Marilleve, linked to Madonna by ski lift. A must-ski is the DoloMitica run, one of the most challenging in the Alps, closely followed by The Star which has a maximum gradient of 70% at one point - you’ll definitely have earned a large vino at the Jumper bar once you’ve skied it! Groups of boarders will love it here - Madonna has a great reputation in the world of snowboarding and is home to the massive Ursus Snow Park, one of the best parks in Italy. If you’re all skiers but want to try something new, Pro’ Snowboarding and Zebra are two specialist snowboard schools where you can all experience the ‘dark side’ together. You won’t have to leave any non-skiing friends behind - ice skating, dog sledding and hotels with pools and spas mean there’s a lot to enjoy while other members of the group are on the slopes. There’s also shopping in the main piazza with a variety of sophisticated stores including fashion boutiques, craft shops and jewellers. If you’re a group of party animals looking for a big night out, Zangola is your best bet, famous as the place to go for late-night partying. The club is located outside the town limits but in past years there’s been a bus that runs all night. If you prefer to reflect on the wipeouts of the day over a few pints in a more chilled environment, Stube has loads of different beers and Bar Suisse and Cliffhanger usually have live music.